To get an idea of the perspective from which I'm writing this mini-review, bear in mind that I'm a long-ish term Nseries user having worked my way through an N73, N95 and N96, and my current phone is a 5800 XpressMusic (which really is an Nseries phone in all but name). I don't have much use for several of the business-related features of the E72 (such as VPN and printing, for example) and won't cover them here. There are also some of the features I used to use on the N95 that disappeared from the N96 and 5800XM but have reappeared on the E72. These features mean enough to me for me to be willing to compromise on the multimedia side of things that is usually less well developed on Eseries devices. First impressions are very important. The build of this device is impressive. It certainly doesn't feel plasticky and flimsy like many competing phones, it has a metallic coolness and weight (128g) about it. Given that the E72 sports a full, 4-row QWERTY keypad, each of the keys is comparatively small at roughly 5mm (W) by 7mm (H) in size. At first I thought I'd have great difficulty using it because of this but I was pleasantly surprised at the speed with which I got used to it. The keys are domed, which helps you feel your way around the keypad, and the action is gentle yet well defined. The ergonomics make the keypad far easier to use than you'd initially think looking at its somewhat reduced size. At 6cm wide, 11cm tall and only 1cm thick, this phone is quite a slab. Slim, but a slab all the same. With a significant amount of metal in the bodywork and no moving parts (this is a candybar phone, not a slider or a clamshell), it feels rock solid. The battery cover is also made of stainless steel and does not creak like the back of the 5800XM or the N96, another detail that makes the phone feel solid. The E72 comes with 512 MB of NAND flash, resulting in a comfortable 220 or so megabytes of free space on its C: drive for installing extra software. This is complemented by a microSD card slot that also accepts microSDHC cards. At the time of writing, these cards are available in capacities of up to 16GB. A 4GB card comes with the phone and is already installed in the slot. It includes, among other things, 2.5GB of maps and the PC Suite software used for synchronising data between the phone and your PC. Personally, I'm using a ByteStor 16GB card in mine. The E72 also has 128MB of SDRAM, which is just about enough for a phone of this calibre. The CPU in this handset is clocked at 600MHz and it shows in the responsiveness of the user interface, especially if you turn theme effects off. Having the screen in landscape mode all the time is certainly "different". Even though the only thing that changes from a more conventional phone is the orientation, you nevertheless have the impression that the screen is larger. It is only an impression, though. Maybe the landscape orientation allows for more information on-screen, or maybe we're just more comfortable looking at something more like a TV screen. Its QVGA (320×240) resolution, however, is lower than what I've been used to for the past 9 months. The 5800XM does have a 360×640 widescreen format display, so switching to this handset will be a bit of a step backwards in that respect. Knowing that this phone has native VoIP support, one of the first things I did was to set up a SIP profile on the E72 and then pay a visit to forum.nokia.com in order to grab and install the SIP VoIP Settings application for this model. The setup was painless and literally within seconds I had connected the phone via my wireless network to my PBX at home running Asterisk and was using it as my "landline" phone. Now, that is a feature that I missed from the N95 and which disappeared when I "upgraded" to the N96. Call quality, for both cellular and VoIP calls, is very good indeed. The sound is not tinny at all, it is rather rich without being fuzzy. The quality of audio transmitted appears to be good as well. I just spoke with my father in France a few minutes ago and he told me that I sounded very clear his end of the line (it was a VoIP call). The good audio quality is valid for the music player, too. And for Spotify mobile. One minor niggle I'd point out is the minor click you hear when one track ends and the next one begins. It's only a quiet click but it shouldn't really be there. Nokia has managed to suppress it in other music-enabled devices such as the N96 and the 5800, it should also be possible to do so in a close-to-top-of-the-range Eseries device. One feature that Nokia haven't sorted out in any of their devices yet to the best of my knowledge is gapless audio playback. Not having it, and having to suffer a pause in the playback between tracks, when listening to live albums, for example, is a bit of a pain. The battery in this phone is a mighty 1500 mAh BP-4L, the same battery as in the N97. The official specs claim that this gives the E72 16-22 days of standby time or up to 13 hours talk time in GSM or VoIP mode (or 6 hours in 3G mode) but, as always with battery life annouced by manufacturers, need to be taken with a skip full of salt given that the conditions in which the measurements are made are not reproducible in real life. While playing with the phone pretty intensively, I've been able to get 3 solid days of life out of the battery, that's with the WLAN connected permanently since I've been using the phone as a VoIP phone connected to my PBX. The E72 ships with a few nice accessories, and some not so nice. First of all, the stereo earphones. I'm afraid they're a waste of space. They reproduce virtually no bass or treble and they're the kind that you're supposed to wedge in your ear, and they invariably fall out all the time despite coming with three different sizes of rubber grommet. Not only that but the inline remote control only has volume up/down keys and a call key, and looks (and feels) cheap and nasty. This phone is fully compatible with the more complete remote control of the 5800 XpressMusic, which also includes track skip, fast-forward, rewind, pause/play and stop controls, and a lock. 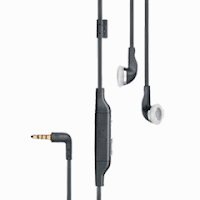 It also has a standard 3.5 mm stereo socket on it into which you can plug a standard set of earphones, such as noise-isolating in-ear buds. Forget the supplied earphones, get yourself an AD-54 audio adapter and some decent earbuds. Your ears will thank you. You can use a microUSB cable to connect the phone to your computer. The supplied CA-101D "cable" (in quotes because it's a bit of a joke, "stub" would be a more accurate description) is only about 10 cm long and therefore probably OK for laptop users. It's no good whatsoever for users of desktop systems because it's just far too short. 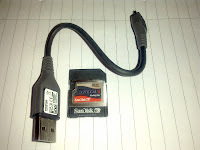 The photo above shows it next to an SD card, which gives you an idea of its size, or rather lack thereof. You'll definitely want to invest in a normal CA-101 cable. Note that the E72 can be charged through the USB port. The rate at which it charges is, however, much slower than if you use the supplied AC-8 charger, which takes approximately 2 hours to charge the battery fully. For the phone's USB port to be fully functional, it needs to be connected to a USB 2.0 port on your computer. My (rather old) laptop only has USB 1.1 and the phone will not charge when connected to it, nor will "mass storage" mode work. USB charging is comparatively rare on Nokia handsets. Another rarity on Nokia phones is HSUPA. All of Nokia's recent 3G phones are in fact 3.5G-compatible, boasting data download speeds of up to 7.2 megabits per second (provided the mobile network supports such speeds) but only the old 3G uplink speed of 384 kbit/sec. Several newer Eseries devices, including the E72, support HSDPA at 10.2 megabits/sec and, very importantly for those who send large volumes of data, HSUPA at up to 2 megabits per second. One feature of this phone that I appreciate greatly is the mode switcher. It allows you to switch easily from "business" mode to "personal" mode and back. You get a different set of shortcuts and notifications on your home screen and a different theme for each mode. It would have been nice for the mode switch to change profiles as well so you can filter out business-related calls when in "personal" mode, for example, but I suppose we can't have everything. Just below the soft keys and above the call make and break keys, there are four function keys. 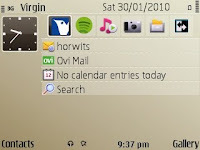 Menu and calendar on the left, contacts and messaging on the right. With the exception of the menu key, all of these keys are in fact programmable. The action in response to short press and a long press can be programmed independently. For example, I have programmed the "calendar" key to bring up the calendar application if I simply press it, or to bring up the clock application if I press and hold it. Or, a short press on the "messaging" key brings up the messaging application's main screen, while a long press on it starts composing a new text message. In the middle is the usual 5-direction D-pad, the middle of which is also an optical Navi-wheel. Swiping your finger over it allows you to scroll in the direction of the swipe. At first I thought it got in the way, but I came round to it after a couple of days once I'd got the hang of it. While on the subject of messaging, the e-mail client built into the E72 is far more feature-rich than that of Nseries devices. I suppose this is normal for a phone being presented as a business device. It is compatible with normal POP3 and IMAP4 services, but also Lotus Notes, Google mail, Hotmail and Microsoft Exchange. Not fogetting Nokia's own OVI Mail service. There are, however, a few things I'd like to see Nokia put right in future releases of the software. First of all, there is no automatic "send to self" feature, nor is there an automatic Bcc: feature to fall back on because of the lack of "send to self". If the E72 moved sent mails over to the "sent items" IMAP folder of the account it's connected to, it wouldn't be a problem, but instead of that it stores sent mail locally and there is no possibility to move mail between folders manually (or, if there is, it doesn't work). If you want a globally accessible copy of any mail sent, you have to Bcc: yourself manually each time you send something. Secondly, the way the e-mail application handles network connectivity needs to be rethought. 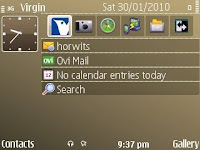 S60v3 with Feature Pack 2 (the user interface on the E72) has a network feature called "destinations" whereby network access points can be organised in a priority list. For example, in the "Internet" destination, I have my home wireless network in first position, followed by my mobile network operator's packet data service. Any application needing a connection to the internet can therefore use the "Internet" destination rather than any particular network access point programmed into the phone. If it does, the phone will first try and connect using the first access point in the "Internet" list, ie. my home wireless network. If that is unavailable, because I'm out of the house, for example, then it will fall back on the next item in the list, my operator's packet data service. Despite the presence of this feature in the E72, the e-mail application only uses specific access points, not destinations. I can set things so that my wireless network is used for e-mail connectivity, and all works fine as long as I'm at home. If I go out, I need to change the access point used, for the inbound mail connection and then for the outbound mail connection, for each of the mailboxes defined. It would make things far simpler if I could tell the application to use the "Internet" destination. The most convenient connection would be used regardless of whether or not I'm in range of my wireless network. The feature is built into the phone, so why does an application a priori developed specifically for the series of phones not use it? The killer application on the E72, in particular since Nokia announced free navigation on several devices including this one, is OVI Maps. It includes walk and drive navigation with verbal prompts in over 70 countries. Other than the fact that turn-by-turn navigation is no longer subject to the purchase of a licence, one of the key features of OVI Maps v3.03 is the ability to log into your Nokia account and synchronize the locations and routes stored in your phone with your online maps.ovi.com account. Another feature added in this version is "location sharing", whereby you can update your facebook status with your location and an optional photo. The resulting status update on your facebook profile will include a link to a map marking the coordinates of the location you shared in this manner. Unfortunately, there is a bug in the firmware of the E52, E55 and E72, which inhibits signing on to your Nokia account. If you try and do so within OVI Maps, the application simply crashes. This very same bug is most likely behind the fact that the e-mail application cannot create an OVI Mail account correctly either. The bug has been acknowledged by Nokia and they are working on a fix. The Nokia employee who posted the message linked to above on the Nokia Support Discussion forums sent me a patch to test on my E72 and it worked fine, allowing OVI Maps v3.03 to access my Nokia account and also allowing the e-mail client to set up my OVI Mail account with no problems. The patch will definitely be included in future firmware releases of these three devices. It is unknown for now how it will be pushed to devices running current (and older) firmware. Before you ask, I have not been granted permission to distribute the patch I was sent. Do not ask me to send you a copy of it. Update 06/02/2010: The fix I was given to test has now been officially released by Nokia. You can grab it from this support page. It is now 4 days since I started writing this review and just over a week since I took delivery of my test E72. In that time I have grown extremely fond of the device, especially the landscape mode screen. In fact, if I look at the 5800 XpressMusic now it looks positively weird. I never thought I would ever be able to use a non touch-screen phone again after the 5800, but the E72 has proved me wrong. I have now managed to reach a relatively fast typing speed, pretty much as fast as I was on the touch screen if not faster, and the fact that the E72 is VoIP-capable is, I think, what really won me over. As I mentioned earlier, I used to have an N95 until the end of 2008, when I "upgraded" to an N96 (in quotes because in many respects, the absence of VoIP and the comparatively poor camera in particular, it was more of a downgrade) and then to the 5800 XpressMusic (also without VoIP) in April 2009. The absence of VoIP on the last two handsets was a major pain in the neck and meant that I had to go out and purchase a dedicated VoIP phone. Despite the complaints I have formulated here, I was so impressed with the E72 that I went and ordered one for myself only a few days after I first got my hands on the loan device. I'm really pleased that I can now have a single phone for cellular and VoIP calls, and I'm equally pleased with the build quality of that single phone. It's a pleasure to use. Incidentally, I signed up with Virgin Mobile on an 18-month contract at £25 per month, which gets me 500 minutes, up to 3000 texts and up to a gigabyte of mobile web data. The phone itself was free, and here's the best bit of it: it's a generic, UK phone and it isn't even SIM-locked! Most of the time when you get a "free" phone from an operator, its firmware has been messed about with by the operator so that you get its logo in your face all the time and so that some features of the phone that they don't want you using have been deactivated. This is not the case here. You'd walk out of a Nokia store with exactly the same phone had you bought it SIM-free. Indeed, this phone is a SIM-free phone. Until now I was on O2 with a SIM-only deal getting me 600 minutes, 1200 texts and 1 gigabyte of data for £20 per month. In essence, I'm paying an extra £5 per month for the next 18 months (so £90 all in all) and getting comparable service given that I never got anywhere near the 600 minutes or 1200 texts, and I just got a phone worth around £350 for free. Not a bad deal after all! I have a E72 too since December (NAM version since I am in Canada). I have configured a Destination with both WiFi and PacketData access points and it works pefectly for all my IP applications. The thing I cannot understand yet is that even when WiFi is present, the phone seems to establish a 3G packet data connection (without really using it). Don't you know why?? This is a problem with all Nokia devices I've used (with the exception of the N900, which always found my WLAN). But if I think back to the N95, N96 and 5800XM, each and every one of them -- in particular the N96 was notorious for this -- would sometimes fail to see the WLAN and switch to packet data instead. This would only happen if the phone was too close to my wireless access point, though. If I was the other side of the house, or even the room, then the WLAN would be detected flawlessly. So, is the WLAN antenna in the phone maybe a bit too sensitive? It's possible. One thing I have found is that wrapping my hand around the phone when trying to connect close to the WAP does tend to improve the detection rate. In short, there's not a lot you can do. In fact, the Destinations seems to work correctly but I just wondering why the 3G packet data connection remains connected even when a wifi access point is detected and that my nokia connect to it. I have then both my 3G and Wi-Fi connection established and I can confirm that all my online application are configured to use the Destination. Maybe it is for fast switching between 3G and Wifi??? The destinations don't allow switching. In other words, if you're connected via 3G and you move into a zone where you have WLAN coverage, the connection will not be dropped and re-established using the WLAN. That would cause all kinds of problems with sites that manage your session according to your IP address if you start the session and then move to another IP address halfay through. Parallel to that you have some applications that don't seem to relinquish the connection even if they're not using it. Case in point: fring. If it's running over the WLAN, and if you then start an application using 3G and then close it down, fring will appropriate the 3G connection and the phone will remain connected to the network even though it is using the WLAN. Solution: tell fring to use WLAN *ONLY* rather than WLAN first. I found a solution that do what I want: Psiloc Connect. Actually, my applications will use Wi-Fi when available and 3G if not. I was sure that Destination was providing that kind of solution built-in. It seems not. I am thinking of buying Nokia E72. Can anyone have any ideas on E72 skype and fring experience. Does skype and fring work reliably on E72? Free navigation with OVI Maps! Software developer, Unix sysadmin. Employed by One Iota. 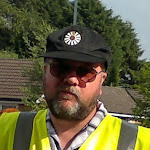 Unless otherwise stated, any views expressed in this blog are my own, personal views and not those of my employer.